(Spring 2019 Nuredo Cover Story) The influence of global cultures is increasingly visible in home decor as technology expands homeowners’ worldviews. Acting on the inspiration of global trends can be as simple as shifting your outlook to bringing eye-catching features and everyday functions into your home. Outdoor living continues to grow in 2019 as homeowners dream of adding spaces that provide tranquility, connection and touches of nature. Now is the perfect time to plan updates to outdoor living areas so as the seasons turn, you're ready to enjoy your outdoor space to the fullest. If you’ve ever opened your closet doors and been depressed by what you see, it may be time to rethink your closet. Creating your dream closet and introducing a new level of organization can help alleviate those worries and provide a fresh perspective. For avid cooks, seasoned hosts and busy families, the kitchen is likely the center of daily life and a place where both form and function are of the utmost importance. This high-traffic space generally influences the design of the rest of the house, and the colors and materials used in the kitchen normally set the tone for the rest of the home. Some home upgrades are aesthetic, and some are for function. These ideas, all with better home safety in mind, show that you don’t have to abandon your designer sensibilities when it comes to improving your home’s overall safety. Today, smart devices seamlessly integrate into connected home systems to make living more efficient, improve home security and even offer advantages for your health. 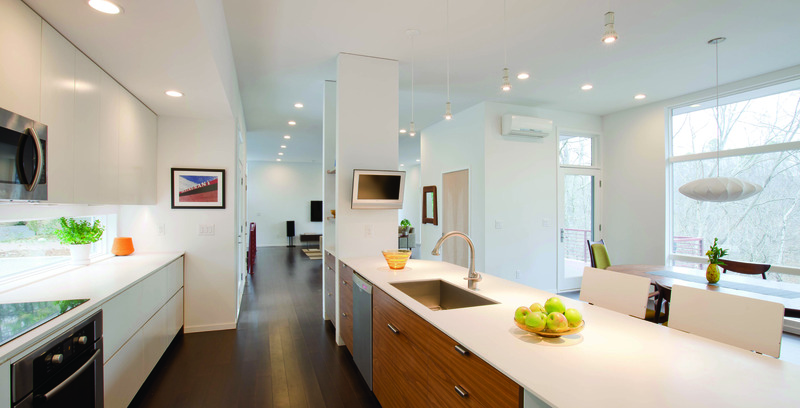 Smart technology is a savvy way to add value and function to your home. Don't let the dull and dreary days of winter get you down. Update your home’s curb appeal with pops of color that add a cheerful touch to offset the oncoming gray weather with these 5 easy tips. Edgington Construction Inc., is a locally-owned and operated company serving the Tulsa area since 2010. The company’s continued steady growth and expansion into new service areas is a testimony to its guiding strategy. Even if you have no immediate plans for leaving your home, it’s a good idea to approach renovations with resale value in mind. Upgrades that are likely to appeal to future buyers protect your investment while also improving your enjoyment of the home. Home technology devices have come a long way, and many homeowners are discovering that their features aren’t just for convenience and comfort. A growing number of technology-enabled home features promote a healthier living space for you and your family. After a long winter cooped up indoors, spring is the perfect time to start re-imagining your home and making upgrades that create a fresh, welcoming vibe. These project ideas can help breathe new life into your home. Timing can be everything, especially when it comes to planning an outdoor living space. By getting a jump-start on planning, you can afford yourself time to complete the process with maximum creativity and minimal stress. No luxurious home upgrade is complete without the enhancements of modern technology. With new products joining this category at an exponential pace, there’s a way to boost the smart function of every room, even the bathroom. A home is often a family’s single largest asset, so making investments with upgrades and home improvements is almost always a good idea. Make smart investments with technology like heated floors and beautiful solar-powered skylights. If you’re looking for ways to improve your home but don’t have the budget for a full-scale renovation, look at upgrades that add instant value with a smaller investment. Spruce up the aesthetics and improve livability without breaking the bank. Discount Garage Door's focus on providing the highest quality overhead doors and related components coupled with their insistence on proper installation technique make it easy for them to back up the strongest warranty in Oklahoma. Today’s hottest looks leave plenty of room for personal interpretation, so it’s easier than ever to incorporate the latest looks for a home that seamlessly blends your personality with on-trend decor and design elements. If you’re one of the 57 percent of women who believes having an organized closet would make finding what you want easier and faster, there’s no time like the present to stop dreaming about having a beautiful and organized closet. Move over, marble and granite. There’s a new, old stone that’s coming back into vogue. After first coming into use 5,000 years ago, soapstone is once again becoming a “go-to” material for many homeowners. (Family Features) While the aesthetic fit of a new appliance is important, so are the features that ensure your purchase answers the needs of your lifestyle. Consider each model's performance when shopping for updated appliances. (Family Features) MAAX Bath Inc. announces the MAAX Professional product line, designed to make it easier for professionals to provide their customers with trend-setting looks for the bath. Now available at Tulsa Winnelson. (Family Features) While painting and decluttering are great ways to revitalize home decor, there's no better way to breathe new life into interior spaces than decorating with light. Let natural light enhance your home décor.